From the time I could hold a pencil or crayon I would draw. At first it was just circles and then the usual stick people. I was fascinated by grocery stores, so a lot of my drawing involved people shopping and rows and rows of boxes and cans. Well, I thought they looked like boxes and cans however, as I often had to interpret my drawings for the grownups I guess they looked more like just a lot more circles and rectangles. I also had a grade one teacher that would draw on the blackboard. She drew different things for each month. In April it would be ducks, rain boots and umbrellas. In May it was flowers. Even arithmetic questions were illustrated by objects like apples, teepees, trees and pumpkins with plus or minus signs between them. It was the best thing about arithmetic period. I filled notebooks with drawings. In grade four one of my friends spent a whole recess and noon hour showing me how to draw a face on profile. After that my glorified stick people became more realistic. Of course, the proportions weren’t right but at least they began to look more human. My parents had to ask less and less about what I was drawing. By grade eight I was writing a book I called “Pioneer Daughters” (go ahead and laugh). As we were at that time living on the prairie in Regina, Saskatchewan, you can imagine what gave me the idea. Anyhow I spent a lot of time writing and illustrating my book. I designed the dresses I imagined the four daughters would have worn and spent a lot of time on the pictures. That year I was asked to construct the grade eight graduation banner and I loved doing that. Grade Nine was so exciting for me. For the first time I was taught art by a real artist, one who had a particular interest in mosaics. He had designed four mosaics for the school lobby, two were already in place and he was working on the third. All four mosaics were to illustrate some part of academia. The one that was in progress was all about Socrates and his students. Mr. Miller, our teacher, and some grade 12 students were working on it. That was the year that I discovered oil pastels. The colours and the way they could be layered and blended enthralled me. I drew a picture of women trying on hats in a store (still with the store fixation) and then I decided to branch out. Our family was a naval family and so one of the postings we had was to Aklavik in the Northwest Territories. I was not happy at the time of the posting as it was interrupting my upcoming Ballet recital, but I was so captured by the immensity, beauty and strangeness of the north that I soon accepted my disappointment. I was not destined for the stage. The north captivated me and so when I was trying to decide on what to draw I thought of a school trip we had taken while I was there. Our teacher had taken us out of school to the river where we watched an Inuit woman cutting up a seal. She was using the uniquely curved ulu (woman’s knife) and was carving up the seal very efficiently. That scene was the one I chose to make an illustration of. I wanted a lot of paper and so I used paper from a large roll of butcher paper and oil pastels. That picture was one of three large pictures with the arctic as the subject. Somehow that picture got misplaced after it was marked. 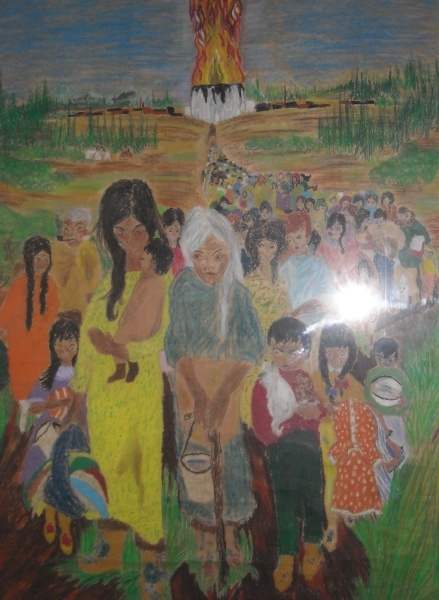 I did two more large pictures: one of the processional at the Anglican Church “All Saints” and one of the shocking oil tank explosion in Aklavik which we witnessed when the townspeople were evacuated (picture above text). At the end of the school year Mr. Miller asked me if I would like to help work on the huge mosaic during the summer and of course, I said yes. It was very flattering to be trusted to cut and place the glass and ceramic tiles in the pattern he had set out. I worked on it about two hours a day for several weeks until, once again, Dad was posted, this time to Ottawa. I was thrilled to do it and I was able to work along side a grade 12 student. Some day I would love to go back to Sheldon Williams High School and see the mosaic I worked on so long ago hanging there in the lobby. That would be a thrill, even though I was just one of the unsung students who donated their time to work on the mosaics. Kidney infection, if not treated promptly, can lead to serious complications, including kidney damage and sepsis (blood poisoning). It is usually treated with antibiotics. In many cases, patients with kidney infection are hospitalized. ..